Great value on three of Madeira's best selling stabilizers and Madeira Rayon Thread Gift pack. PLUS GET A SPECIAL ASSORTMENT OF STABILIZERS FREE to try and test for different projects, Needles and snips also included in this bundle. Eighteen 220 yd/ 200 m Smart Spools of lustrous Madeira Rayon embroidery thread, the number one choice of embroidery professionals around the world. One Smart Spool produces an average of 40,000 stitches or 40 embroidery designs. All spools have double locking end caps and come in a dust-proof plastic container. Thread colors may vary, but are always pulled from Madeira's most popular Rayon shades. Super Strong: 12" x 5.5yds, heavy weight, soft, non woven, available in white and black. 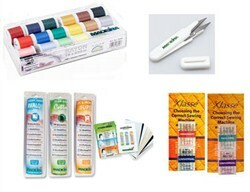 Ideal for embroidery designs with a large number of stitches and/or high stitch density. Works well on open-weave fabrics where a complex design is needed. Also guarantees exact typographic image retention for logos and emblems. Cotton Soft: 12" x 11yds, non-woven with a smooth finish and soft feel, available in white and black. 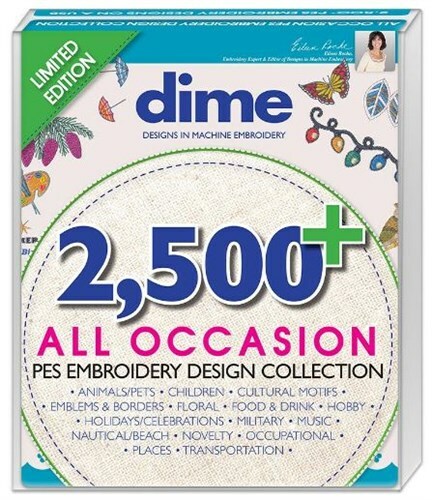 A wonderful choice for all types of machine embroidery, monogramming, decorative stitching and cut work. Does an excellent job of preventing fabric shifting during stitching and produces super-clean edges. The natural cotton fibers make it environmentally friendly and extremely soft and comfortable against the skin. Ideal for appliqué or as a backing for buttonholes. Avalon Film: 12" x 11yds, water-soluble, transparent, clear film only. Ideal for knits and looped fabrics, such as terry cloth. Prevents stitching from sinking and disappearing into the nap of the fabric. Stretchable and delicate fabrics will no longer lose their shape as you sew or embroider on them. Use Avalon film for velvet, knits, silk, organza and netting. Try it as a backing for buttonholes, to transfer quilt patterns or for sandwiching or pizza techniques. Use for precision cutting. Especially good for trimming jump threads in machine embroidery. Variety packs of five needles each with a handy guide for choosing the right needle for your project.